Exercise was my last resort. I’ve heard this statement only a couple of times, but each time it makes my head spin. I have to ask what it is that makes people choose to undergo a surgical procedure, try multiple medications and every alternative therapy under the sun before resorting to exercise. One option is that people sometimes view exercise as being hard work and prefer to take an “easier path” to deal with their issues. Essentially the hope is that someone else will fix them. You have a bad knee, get a surgeon to throw a new one in and you’ll be right to go. Unfortunately it’s not quite that simple. The months of rehab work (exercise) needed post-surgery will make you wish you just tried exercise to start with. Medications may help with many conditions, exercise may cure the condition or prevent its occurrence in the first place. Exercise doesn’t have to be hard work. Sometimes the right exercise for a condition won’t even raise your breathing rate, heart rate or bring on a sweat. It’s not all about boot camps and working till you drop. It’s about finding the right exercise for you, for your needs and taking solace in the fact that it’s doing great things for you. Could it be a lack of quality information from those we go to for advice? A series on low back pain by the global medical journal, The Lancet, mentions that most low back pain sufferers aren’t getting the most effective treatment and advice which is to stay active and to exercise (exercise appropriately is key!). Instead, advice given is often to rest, take pain killers, get spinal injections and surgery. I am hopefully that times are changing and the importance of regular exercise is more at the forefront of people’s minds when thinking about how to best address injury and illness. Your body is yours and your health is yours. Others can give you advice and point you in the right direction but in the end you need to do the work to reap the reward. I strongly believe that every person out there can benefit in some way from a well tailored exercise program. In the end, exercise can be a free and easy way to make change to your health issues. All you need to do is grab it with both hands and don’t let go. Ultimately exercise should be your first stop on your journey to good health and well-being. Get some advice from a quality health professional and give exercise a red hot go before you move towards other options. You’ll find the start of the boardwalk in Hallett Cove (or you can start at the other end in Seacliff), a 35 minute drive from Adelaide. The walk itself is a 10.2km return walk rated as a moderate hike. If you aren’t up to 10.2km, it’s very easy to walk as far as you wish and turn around. It’s a scenic walk along the cliff-tops of Marino and has numerous valleys and resultant stairs to climb. There are also several little paths in the valleys that you can explore to take you to the rugged beaches. You can find plenty of birdlife and if you’re lucky and have a good eye, some ocean life may show itself also. At the Hallett Cove end there is also a great café for lunch and or a coffee after your walk. 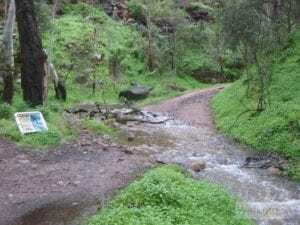 A little further from Adelaide at a 75 minute drive, this little gem of a trail is one of the most scenic around. The rugged cliffs and coastline of Newland Head Conservation Park provides some amazing views. The trail itself is rated moderate and is 11.5km one way. Keep this in mind as you may need someone at the other end to pick you up if you choose to do the whole one way walk. Alternatively, you can walk just a part of it and turn around. Just a whisper away from the CBD at a 15 minute drive, Chambers Gully is Waterfall Gully’s little brother. The trail to Mt Lofty is a 15km circuit, rated hard hike with steep sections so make sure you are prepared if you are doing the full loop. If you want more of a casual walk, the first few kilometres of Chambers Gully are less strenuous and very scenic. There’s lots of wildlife to be seen if you keep your eyes open. bout Port Noarlunga given I spent many days there growing up. But I’ll stand by my claims that it’s a top spot. It’s a 40 minute drive from Adelaide and has numerous activities available. You can hire snorkels and fins from Elite Dive Academy and go snorkeling out at the reef. There is a jetty that will lead you out to the reef which you can also walk on and explore at low tide. If you take a short walk over to the river you can hire kayaks from Easy Kayak Rentals and have a cruisy paddle down the river. For those wanting to hit the waves, South Port Beach sits at the south end of Port Noarlunga and can often have a nice wave rolling in. Need a board? Preece’s Surf shop can help you out. A quaint little town on the coast about a 90 minute drive from Adelaide. Great spot on a nice day for some fishing, kayaking or just a swim. Don’t miss the walk around the bottom of the cliffs to explore a little more. There are some great other little beaches and places to explore if you are willing to have a look around. 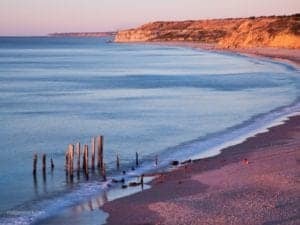 Port Willunga is a quiet little town about a 50 minute drive from Adelaide. The beach itself sits in a bay and is a little protected from the elements. There is a lot of beach to spread out on and the cliffs that overlook the beach can be quite scenic. The Star Of Greece café sits at the top of the hill, named after an iron cargo ship that wrecked here in 1888. The wreck provides a great diving spot for keen divers. Snorkeling off the beach is also very accessible. If you like to travel, Innes National park is a wonderful place to visit. There is lots of historical walks, shipwrecks, surf breaks and protected bays to explore. You could easily spend a week there doing walks every day and not get bored. This is literally a hidden beach. When driving into Stokes Bay you are greeted with a rocky bay and a boat ramp. If you care to find a park and do a little searching, there is a narrow path/cave that makes its way through and under rocks, opening up to a pristine white sand beach. There is a protected wading/swimming area for the little ones and if the conditions are right there can be a fantastic little left hand beach break for the keen surfer. These really are just a handful of quality outdoor environments the Adelaide region has to offer. When it comes down to it, if you are outdoors and moving and enjoying it, then you are in a great place. If you want to find more great trails WalkingSA has a great database of trails throughout the state. If you want to explore Adelaide’s trails and beaches more but feel you can’t due to injury or fitness levels. Come in and see us. We can get you on track (or in the water) in no time.